Stock# - 01073tgs Three White Roses - Since Queen Victoria's wedding in l840, a traditional romantic era began with gentlemen starting to send flowers to their lady friends to convey special meanings. Also named The Flower of Light, white roses stand for everlasting eternal love and loyalty. 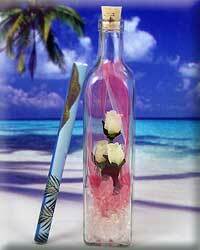 This petite bouquet in a bottle is a very special way to say I Love You . Stock# - 01046tgs Message in a Bottle Softer Side Pink Rose. 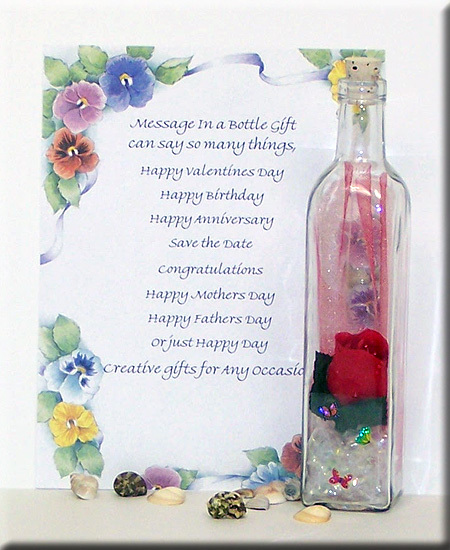 This is one of our MOST popular Message in a Bottle gifts. A Pink rose is a symbol of new love, appreciation and or motherly love. 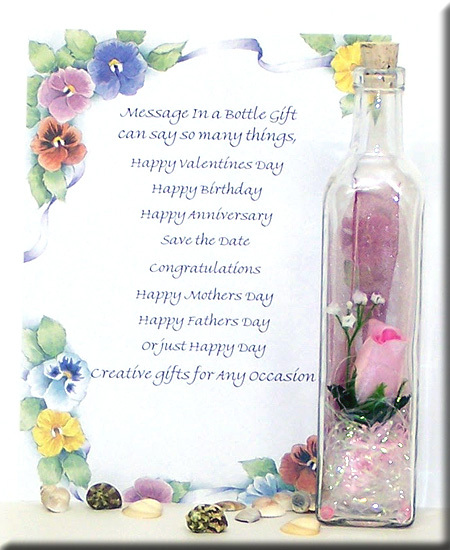 It features a beautiful Silk Pink Rose and Babies Breath with a soft pink background. Select a scroll from the drop down menu and enter your greeting in the box below. 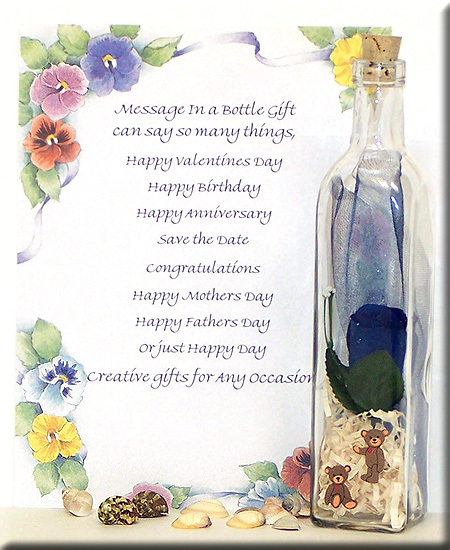 Stock# - 01088tgs Message in a Bottle Blue Rose Legend - The story behind this Lovely Blue silk rose says it all and is a very romantic gift for him or her. A beautiful and unique Message in a Bottle greeting for any occasion of love. The Blue Rose Legend signifies mystery and the obstacles many of us must overcome. Select a scroll from the drop down menu and enter your greeting in the box below. 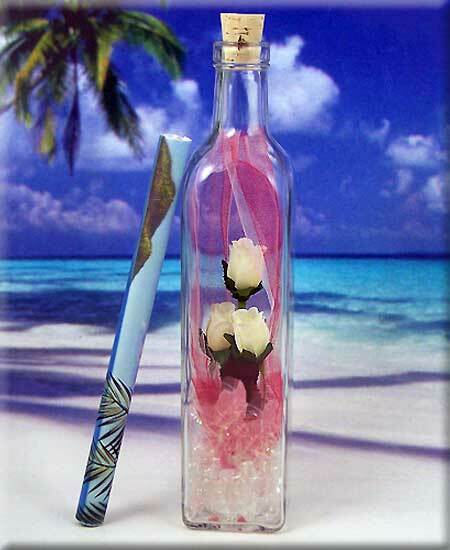 Stock# - 01045tgs Message in a Bottle, A single red rose is a symbol of courage and respect. The ultimate romantic gift highlighted with iridescent shred. 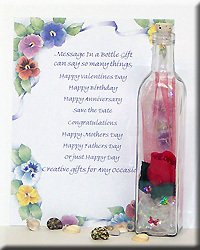 This is one of our most popular romantic message in a bottle gifts. Select a scroll from the drop down menu and enter your greeting in the box below. 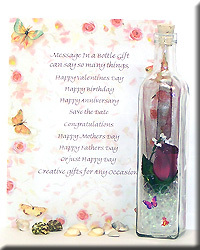 Stock# - 01081tgs Message in a Bottle Red Roses and Babies Breath - Red Roses symbolize love, courage, passion & respect. 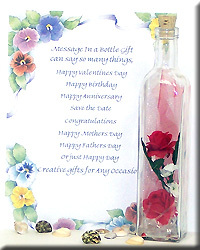 Send your loved one these red roses complimented by babies breath and a iridescent red and white back ground. 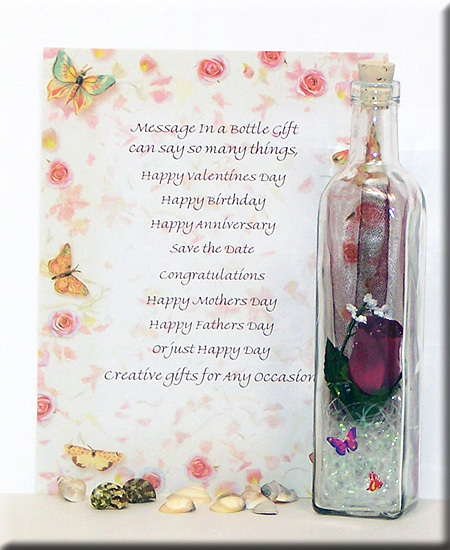 A beautiful greeting for any occasion, especially Mother s Day or Valentines Day. Select a scroll from the drop down menu and enter your greeting in the box below. 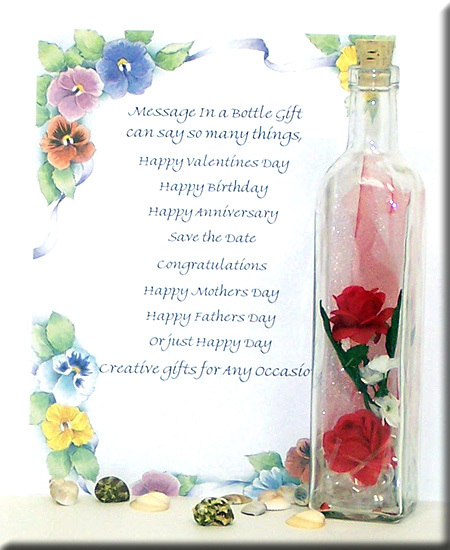 Stock# - 01083tgs Message in a Bottle Burgundy Rose - This Unique and very romantic gift for him or her, for any occasion. Send your loved one a beautiful Burgundy colored silk rose complimented by a black and burgundy background. Select a scroll from the drop down menu and enter your greeting in the box below.